It’s not just Steam Workshop support, there is another important feature coming with the next ETS2 and ATS update. Compared to where we were only a year ago with the whole wheel being just one monolithic truck part, there’s no other way of putting it: we’re going to provide you with ultimate wheel customization! We were never quite happy with the existing system, it was too limiting. Customizing wheels should be more varied, more flexible, more fun! We have split our wheels into multiple components: Tire and Disk separation was introduced recently, in addition to it we have now added customization sub-components of the disk: Hubs, Hub Covers and Nuts. 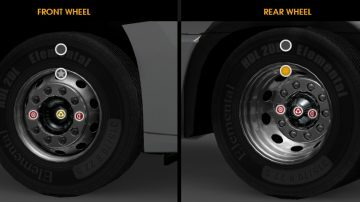 Advanced wheel customization will come simultaneously to both Euro Truck Simulator 2 and American Truck Simulator with the upcoming update. 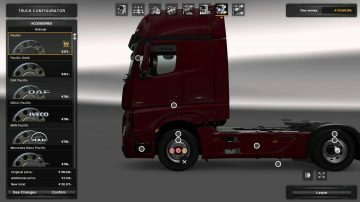 Just splitting the existing wheel models into parts that you can recombine according to your wish will already give you a vast variety of different looks. On top of it, we’ll soon release a small but cool DLC with extra wheel tuning options – things like paintable metal parts or crazy nut designs. Stay tuned!